Rui En Issues A Statement. Rui En tells us it’s an error, that it wasn’t what it seemed. So Rui En has responded with her own take of events. It’s only fair we hear her side of the story. Especially because we don’t know her, so we can’t judge her. She posted this onto her Facebook account a day after reports came out in the media. 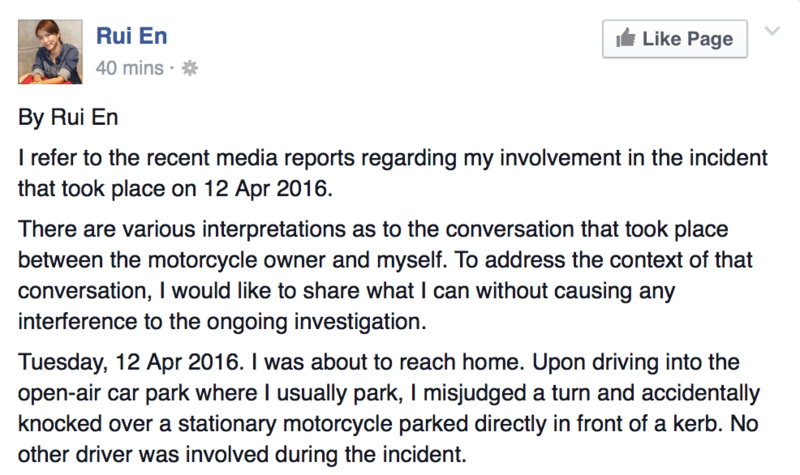 I refer to the recent media reports regarding my involvement in the incident that took place on 12 Apr 2016. There are various interpretations as to the conversation that took place between the motorcycle owner and myself. To address the context of that conversation, I would like to share what I can without causing any interference to the ongoing investigation. Tuesday, 12 Apr 2016. I was about to reach home. Upon driving into the open-air car park where I usually park, I misjudged a turn and accidentally knocked over a stationary motorcycle parked directly in front of a kerb. No other driver was involved during the incident. I was very disappointed with myself for knocking down the motorcycle. My initial intention was to move my car to a traffic-free spot before addressing the matter. I was subsequently stopped by a man. He continuously knocked on my car window while I was attempting to move my car. I later discovered that the man was the owner of the motorcycle. I tried to signal to him to allow me to move my car first but he persistently hit my screen and gradually, his knocks got louder. I got out of my car. I attempted to explain that I would take full responsibility. He probably had the impression that I looked like someone that would run away from the scene. In my state of anxiety, I told him “Do you know who I am, I live upstairs and won’t run”. He appeared to be very angry. I was unsure what I said came out sounding entirely different from what I meant. I was simply trying to convey that I live here, people would know and recognise me if I ran away. On hindsight, my choice of words used were inappropriate and I agree that it caused unnecessary misunderstandings. What was said next was a process similar to most traffic incidents. I offered to compensate for the damages. I offered him monetary compensation in the form of cash. He was not satisfied with the amount offered and asked for more. By this time the police has been called in. I would like to reiterate that it was a judgmental error on my part, there is absolutely no excuse on my careless driving and more importantly, I truly regretted it. I would also like to take this opportunity to apologise to him for the inconveniences and distress caused. Looking back I wished I handled the situation with more tact. I sincerely apologise for the unnecessary inconveniences caused and I thank everyone again for your care and concern. She clearly didn’t take any of our advice. She’s gone her own way, she’s her own woman. She did say it was an error of judgement on her part. But Rui En, were you intoxicated? Did you stop for a tipple? She never addressed that. Not once in the post, it was a perfectly engineered response from an actress with her own website that’s probably not run by her. So if Rui En wasn’t intoxicated, why was she taken away by the police? Good luck at the Star Awards pal. » Singapore Newspaper Published Photo of Dead Bodies: Unethical or Truthful? » Pssst, Sylvia…here’s a better idea than your unemployment insurance! NUS peeping case: When good boys turn bad, should they be given a chance?